RoMedic™ Eva450 mobile patient lift is a versatile mobile patient lift for all lifting situations and for users weighing up to 205 kg/450 lbs. When used with Handicare's functional and easy-to-use SystemRoMedic lifting accessories, Eva450 is the right choice for lifting in connection with transfers to and from the floor, chair or bed, as well as for horizontal lifting and gait training. Eva450 is available with standard height legs or in a special low leg version for use with low hight beds. All variants of Eva450 are supplied complete and ready to use, fitted with a stable sling bar with reliable safety latches and a hand control. The sling bar is standard width (450 mm/17.7") which is suitable for most users and lifting situations. Strong and stable, SWL 205 kg/450 lbs. 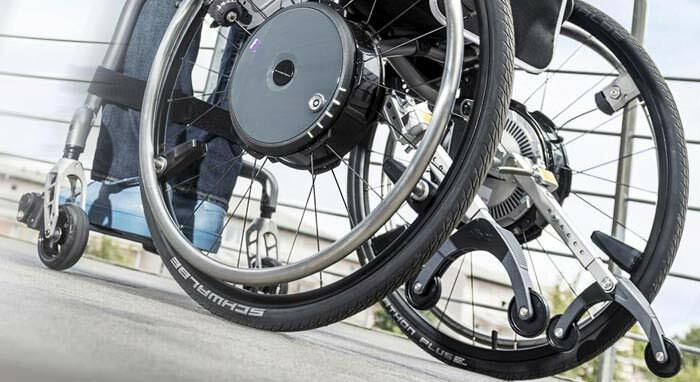 The special versions with low legs are fitted with double front castors with a diameter of 35 mm/1.4"
SWL 451.9 lbs. 451.9 lbs. Base width, outer dimensions 26.9" - 38.5" 26.9" - 38.5"
Base width, inner dimensions 23" - 34.6" 23" - 34.6"
Total weight 74.9 lbs. 74.9 lbs. Front castors, diameter 3.9" 3.9"
Lifting range 19.6" - 70.4" 19.6" - 70.4"
Sling bar width 17.7" 17.7"